One main challenge every destination faces, regardless of size, is how to get the most return on investment from their marketing dollars. When a DMO (Destination Marketing Organization) is looking at their budget and various marketing programs, there are many options for programs that can be created. The trick is to understand what will provide the best bang for their buck. One answer that often rises to the top is that locals and business employees have an impact (both positively and negatively) on not only visitor experiences, but how often travelers come back and share their experiences with others. This is why it is critical for destination marketers to have employees as brand ambassadors. Applying resources to help educate the people who live and work there – the folks that come in contact with visitors every day all day – can pay dividends. 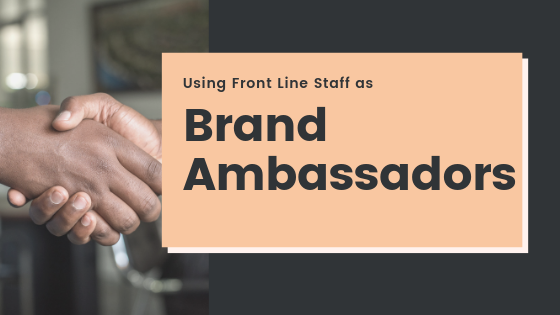 From hotel front desk clerks, to restaurant wait staff, and anyone else who interacts with the public, these individuals can be the very best brand ambassadors anyone can wish for. However, if you want brand advocacy, they must be knowledgeable about all the treasures a destination has to offer – not just what they do in their own day-to-day. These employees are perfectly positioned to share the brand story, but they must be sufficiently trained to do so. This is not typical customer service training. This is specific brand advocacy training, with employees as brand ambassadors. Why train employees as brand ambassadors? Turning frontline staff into marketing ambassadors for your destination can have a tremendous impact on the time and dollars visitors spend in a destination. Frontline staff are in the right place at the right time to influence visitor choices and engagement in a destination. Investing in a well informed front line staff trained to sell your destination is a wise marketing investment. What does good eLearning look like? Instructional design matters. Good eLearning engages learners and is designed to simulate real-world scenarios. Reading passive text, viewing powerpoints and answering questions online is not eLearning. These may be incorporated into eLearning, but learners should be immersed in an interactive experience for optimal knowledge retention. One such example is Cayuga County, a county in the New York State’s Finger Lakes region. Cayuga County Office of Tourism’s award-winning Destination Marketing Ambassador Program is an excellent example of interactive eLearning. See for yourself: watch a one-minute video showcasing Cayuga County’s program or test drive their interactive modules. 1. Does the firm take a team approach? The best eLearning is created by a team with specific skills that work together to build the learning experience. Instructional designers understand adult learning theory and instructional best practices. They design interactive activities that promote knowledge retention and skill application. Graphic designers determine the visual layout of materials and create design elements aligned to an organization’s branding. Production associates have the technical skills to create content in various formats such as interactive experiences, videos, and games. Subject matter experts (SMEs) have in-depth knowledge of a destination and share their expertise throughout development. SMEs may be DMO staff members, tourism partners, or consultants with deep knowledge of a destination. Break the Ice Media’s associates are often called upon as destination SMEs. 2. Will the modules be custom designed for my destination? 3. How long does development take and what is the DMO responsible for? Development time varies by the complexity of the project. DMOs give insight into the destination and provide assets such as images and videos to the production team. 4. How will learners access the program and how will results be measured? Training is accessed through a secure portal, called a Learning Management System, or “LMS.” Ask how user data is secured in the system and what reports you will receive to measure results. 5. How do I get people to complete the program? An experienced firm will be able to advise you on the best strategies to incentivize learners to complete the program.